Information professionals come from everywhere. When working with people on projects and talking to them at events, they tend to come from four distinct areas. I’ve met a lot of people from the library sciences in the industry. Many have found their way to records management while others have worked on taxonomies, search, and general findability. Compliance/legal is a ripe area full of information professionals that you don’t encounter until you really start to look at records management, information governance, and the world of eDiscovery. Information Technology is the area from which I came many years ago. I went from what to how and then to why. Many technologists get stuck looking at information simply as bits and not as the lifeblood of the business. The last one, line of business, is a diverse bucket that is full of people who were placed in charge of a system. They may be part of a larger team from the business working on the project or the representative domain expert. These are the people that the project is meant to serve. I ran a quick twitter poll that omitted line of business as an answer, and 87% answered “Other” as the source of good information professionals. Maybe I shouldn’t have qualified with “good” but it was clear that there was no single source. Project Managers (PM) was mentioned out as a source of information professionals. A PM gets assigned to a project and ends up managing those types of project forever and may evolve into a program manager. Those PMs can come from any of the areas and bring with them different perspectives. Where do those people go after the project ends? Do they really only do one project? I will quickly concede that anyone that works on one project and moves on is not an information professional. They can benefit from the same resources and tools but managing information is not their career. What happens to people after their first project? What determines their path? To be honest, many run away screaming. When there are a lot of failed projects in the industry, giving many people a negative experience. They state, “never again,” and move on to something more career enhancing. Others were never destined to stick around. Regardless of where they come from, they complete the project and move on to the next challenge. This is true of many line of business and IT people. Who sticks around? Those that own the system from the business side. Those who have to answer to the compliance requirements. Those that build iterations of the systems. Those whose job of making information readily discoverable never really ends. Consultants stick around in the industry. 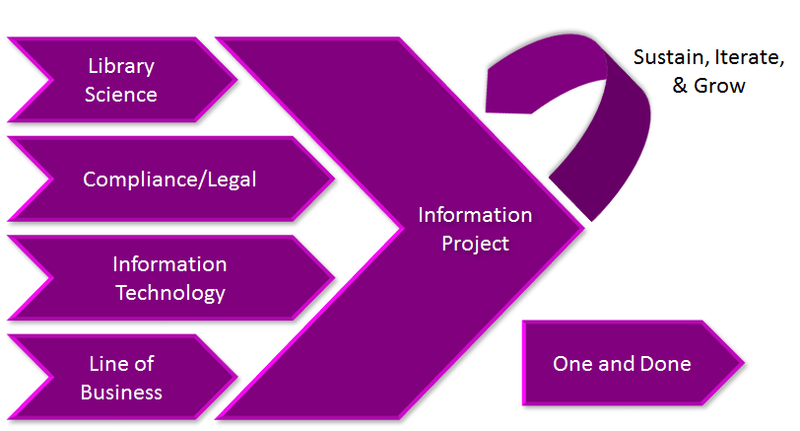 If they are successful and don’t run away from information projects, they can take what they learn in a project and apply it to the next project. The more they deliver, the more they can charge. Many are eventually hired into companies that want to establish programs and have large needs that are not going to go away and want to pull on the diverse experience of former consultants. Are they all professionals? Yes. They make their living by managing information. They may not have an active project for a new system but they are working to enhance and improve the systems with which they are responsible. They need to constantly learn about new trends and new ways to increase adoption. None of these people may view themselves as information professionals but they are. Why they don’t is partially revealed by the next question. For a profession to really exist, there should be an end-goal. What do you hope to be when you grow up? There was no consensus in the poll on what is the ultimate career position for an information professional. In fact, 30% said that there was no such thing. 40% said that it was to be a CIGO (chief information governance officer), a position which does not exist in most organizations, explicitly or implicitly, today. When I attend conferences, we all share common experiences from projects. We trade stories about how we started in this industry. Very few of us have a clear-cut picture of where this career is taking us. I’d love to look at the raw data AIIM cites. The activity that they notice likely coincides with the points where information professionals draw value. I have not been a continuous member of AIIM during my entire career since my first project began but I have been an information professional the entire time. It is a matter of value derived at different stages of my career. In the middle stage, attending conferences was a tough sell. I’d get one conference a year, perhaps, and it was almost always a vendor conference because the value I got to pull from there to my clients was tangible. Now I attend broader industry conferences because now I am a recognized speaker in the industry. Most of my conferences are speaking opportunities. I can add one or two others a year as an investment but there have to be priorities in spending. I will gladly point anyone new to the space to AIIM to get started. They have a lot of solid training. I will point anyone towards their conference. Otherwise, I let them choose the value that they need for themselves. I don’t assume that someone else’s needs will equal my own. What is your story? How did you get started? What is your ultimate goal? Drop a comment or email me to the address on my About the Word page. Let’s share stories and work to really define who we are. My first ECM project was code named “Titanic.” I was put into a cube with physical copies of the manuals and told not to leave my cube until I was an expert. The technology seemed to strike a chord with me. It was successful and later Information Weekly published an article about it. Success from expected failure is always a powerful motivator. Records Managers are already in the realm of being information professionals. If you are managing records, you are managing information. The question is, where to RMs COME FROM; that would be the question to ask. 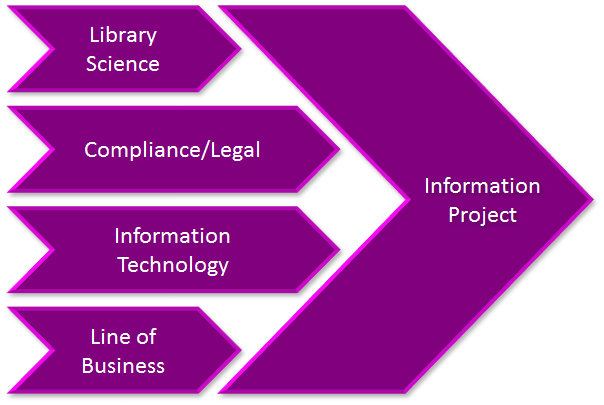 Most that I know tend to come from library science, compliance, or line of business. That said, the RMs that I know may not be representative. I agree that RMs would be included under Library Science in Laurence’s concept of the world (which I rather like, btw). Ideally, I’d marry their knowledge of info lifecycle and classification, etc. with IT’s knowledge of how to support them with technology. The challenge, in my experience, is that in many orgs, neither really wants to talk to the other — if indeed there’s even the thought for them to do so! For the record, I love consulting and advising, especially since I’m doing far more strategy work and less in the weeds, tactical stuff than before. It’s also very cool to be working with the vendors and service providers, rather than exclusively with client organizations. Assuming “treadmill” as having a slightly negative connotation, there is a treadmill-like aspect, of course. But mostly not. I’m quite lucky. Chris, I’m on the same “treadmill” so it wasn’t meant in a negative way. I do love advising quite a bit and I love it when something I do makes a client’s life better. My point was that if the pinnacle of the career is consulting, and you are already in consulting, then you are just working your way up that heap. Not sure it helps define a profession. So that’s MY pinnacle, not everyone’s. You and I both know that there are many that we come across daily/weekly/monthly that desperately want to climb that ladder and land in the c-suite; good for them, not my bag. You’re right that my answers won’t help define the Info Pro profession, but I think that in my position (and I am certainly not unique or alone) I can contribute to evolving the profession, thereby adding some definition. By the way, I really mean consulting and NOT contracting. And to be a decent consultant you need to be at or near the top of your game. How did I get started? At the very beginning… Cobol coding in the ’80s and writing (coding) the first Document Management systems in the early 90s, before DM/ECM became a platform you can buy. At the same time I also started my journey into Workflow (Staffware), which is why I can never see ECM/BPM as separate tracks. I then spent long and fun times coaching Pharmas how to architect their Information (from dossiers to packaging) into DCTM. Then an ECM consultant with Capgemini across different industries. Then with vendors, teaching technologists how to articulate WTF “Information Management” means, in business terms. Am I an “Information Professional”? Who knows? I think I am, therefore I am. More importantly, who isn’t an Information Professional? Operations managers that use information to optimise processes and reduce risk? Call centre operatives who search, use and enhance knowledge bases every hour? R&D folk who constantly generate, evaluate, credit and discredit information? Lawyers, whose entire career is based on digesting and regurgitating information? Doctors, who are bombarded with new Information which they don’t have time to assimilate, while they are struggling to deal with patient forms, charts, perscriptions, referrals, etc.? I’m not sure I can distinguish anymore who is and who isn’t an Information Professional, and where the boundaries between Information supplier, consumer and manager are. I got my start in 1997 when my stepfather, who worked for a little company in the IDARS space, told me they were looking for a webmaster. I interviewed and it turned out what they wanted was a software QA person. 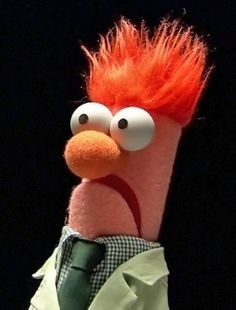 I got a copy of a 2-page outline of capabilities and was told to “go test it”. A few years later, we decided that we wanted to be a “records management” software company. I drew the short straw and got a copy of DoD 5015 v1, a copy of TNA 099, and the remit to determine what we needed to build to make a RM software. We knew about AIIM – it was the big annual show all the sales & marketing people went to – but I didn’t know anything about ARMA until I stumbled across the Mile Hi Denver chapter while I was researching RM requirements and resources. In the years since I’ve been a vendor, a trainer, an end user, a business manager, and a consultant. I’d like to think that I bring some of each of those perspectives to the table when I discuss info mgmt stuff and that I bring the right amount of each to the discussion depending on its context.